When Al and his fiancé, Jennifer, came in to meet with us, we knew we would have fun with this couple. We have known Al since he was in elementary school with our son. Al and Jennifer too, go far back… They started as neighbors, then friends, and eventually that turned into a romance. Their love story started right here, in Newhall. Nine and a half years of dating, and Al finally popped the question in Big Bear while snowboarding. When it came time to do their engagement photos, they had tons of ideas. 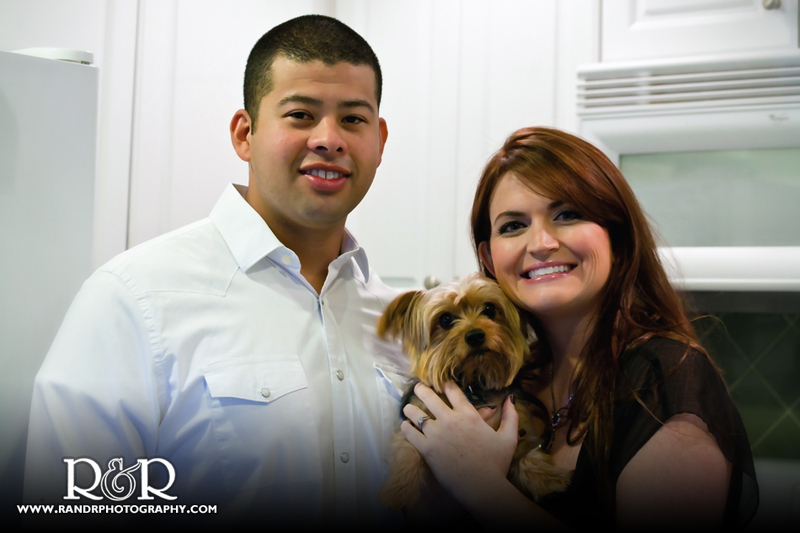 The first part of their session was at their condo with their cute little Yorkie, Ace. Jen is quite the baker so they wanted to incorporate her love for baking and Al’s enthusiasm for her sweets into their pictures. I don’t think Al minded eating the cupcakes for multiple shots! The next stop was at TPC to take some photos near the lake and catch their love for country by rocking some cowboy boots and hats. We then moved onto their old stomping grounds: Hart High School. Here we caught them kissing in the bleachers, tossing a softball on the field, and throwing around a football. We were able to get to know them even better and capture a lot of their personalities in these photos! We couldn’t wait to hang out with them again at their wedding. When their wedding day arrived, we knew exactly how to get these two smiling for the camera. The bride and groom got ready at Hyatt Westlake where we captured some great getting ready shots and special moments, especially the first look with Jen and her dad. It was a priceless moment. Thanks to the Friday night traffic on the 101, we risked losing precious shooting time, so I took the bride, her matron of honor and maid of honor in my car so we can get all the pictures we would need, and not have to wait for the limo to make the round trip back after dropping off the guys. Luckily my cooler was loaded with cold water and snacks for everyone. Once we arrived at Spanish Hills Country Club, we went right into their moment to remember. It was such a touching exchange for these two. These intimate moments for a couple are a memory to be cherished forever, and we take that very seriously. As we shot the ceremony and moved into the reception, there wasn’t a detail left undone. There were personal touches everywhere. With the intimate group they had, you could see all the love for one another throughout the room. Everyone knew each other and had a great time. This was one group that sure knew how to party! We were so happy to be a part of this beautiful day and go home with a yummy cookie for the drive home. Thank you so much Jen & Al for sharing your day with us, and for all the nice posts on Facebook. We love your album too…that’s why it became a sample book at the studio.